The key to the success of any waterpark is the ‘experience’ received by each and every visitor. A successful waterpark should be a landmark; an instantly recognisable destination. Themes play a crucial role in creating the atmosphere and successful themes and waterpark concepts must be fun and imaginative whilst taking into consideration the local geography, demographics, ethnic and cultural background of the potential market. Our story begins almost 6,000 years ago… in the time of the Sumerian peoples of Mesopotamia, which is now called Iraq. The Sumerians had a legend, the epic tale of Gilgamesh, that told of a magical island, of a ‘garden paradise’, a secret magical island called ‘Dilmun’; it was a place without death or sickness and with an abundance of sweet waters, springs and shallow wells. According to the legend, ‘Dilmun’ was the location of the spring of eternal life. Now, next to the Al Areen Spa development in the heart of the island of Bahrain, the legend has come alive again! Skilled worked have recreated an ancient Dilmun and Macedonian settlement. 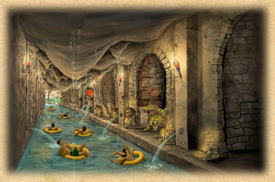 The ‘Lost Paradise of Dilmun’ is an oasis of bubbling springs, cascading waterfalls, flowing waters, raging wadis, lush green plants, rivers and submarine caves that certainly looks like the fabled ‘Garden of Paradise’.